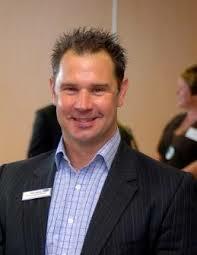 Exeter Business Network May’s event – networking knowledge and opportunities from start to follow up and beyond! “You need a lot of different types of people to make the world better” so said Joe Louis (born 13/5/1914) and the same can be said for making your business better. You may have challenges, you may wish to expand,you may need specialist advice, you may need to recruit, you may need to develop your team, you may need tp promote your expertise, you may need to just get out of the office, you may need to just meet people face to face over a relaxed lunch, you may need to engage with the local business community, you may need to develop your networking skills – well that is all available to you……..
13th May at Exeter Racecourse and Conference Centre. 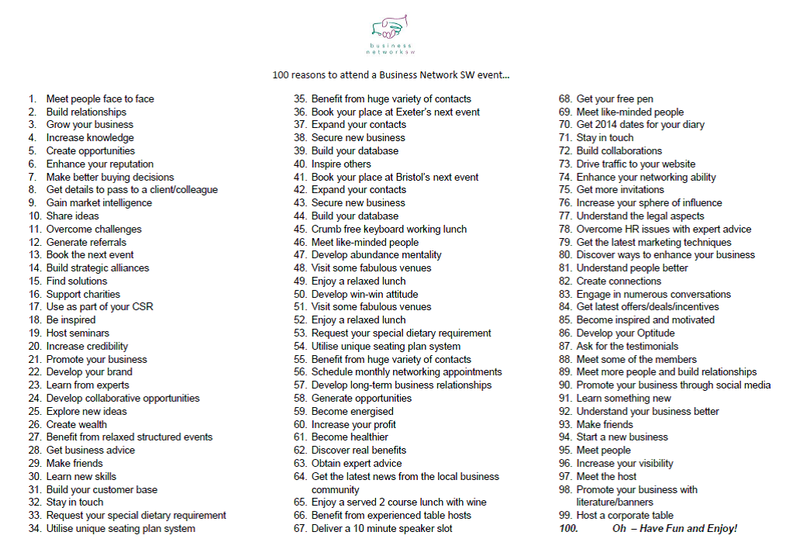 In fact here’s 100 reasons to come as a starter……………. From Forbes Magazine “Connections make the world go round. They help you get things done faster and more effectively” They are the greatest source of new ideas, information, and opportunities. This great image from a Forbes article by Joel York shows this! Connections open doors, but relationships close deals. Networking is not just about exchanging business cards and connecting on LinkedIn and/or Face Book or following on Twitter. Networking is most valuable when long-lasting, mutually beneficial (win-win-win) relationships are formed. This seminar hosted by Sean Humby will take you through a step by step process to enable you and the people that you meet to get more from any networking that you do! Pre lunch drinks and informal networking from 11.45am. Sit down for 2 course lunch with coffee at 12.30pm. You sit down for 2 course served lunch (bread rolls, main course and dessert with coffee), no buffet here – conversation – not queuing is key! You will sit on a table with 7 or 8 other decision makers – none of whom do what you do – a table host will ensure that each person gets 3 minutes to introduce themselves and their business and the benefits that it brings to others. A great catalyst for questions that lead to the all important conversations that generate the connections and collaborations – sharing knowledge, advice, tips, expertise in a relaxed and comfortable environment. No sin bin in operation – just a donation to the Exeter Business Network charities if your mobile device is heard! From 1.30pm – table to table networking. Your opportunity to go and talk to someone else in the room (the seating plan in your event programme will help you locate them), continue your conversation or start a new one with someone else on your table. As a member at subsequent events you will be sat with different people – unique to Business Network events! Our speaker during lunch (from 1.40 – 1.50pm) is the multi-talented Chris Wood of Q Social Media – sharing top advice on getting more from your social media activity. There will some closing announcements and the event finishes at 2pm – all you need to do is follow up! Or continue your conversations at the venue. Exeter Racecourse and Conference Centre – from the course! « Reporting from Bristol Business Network’s April event – what a buzz!